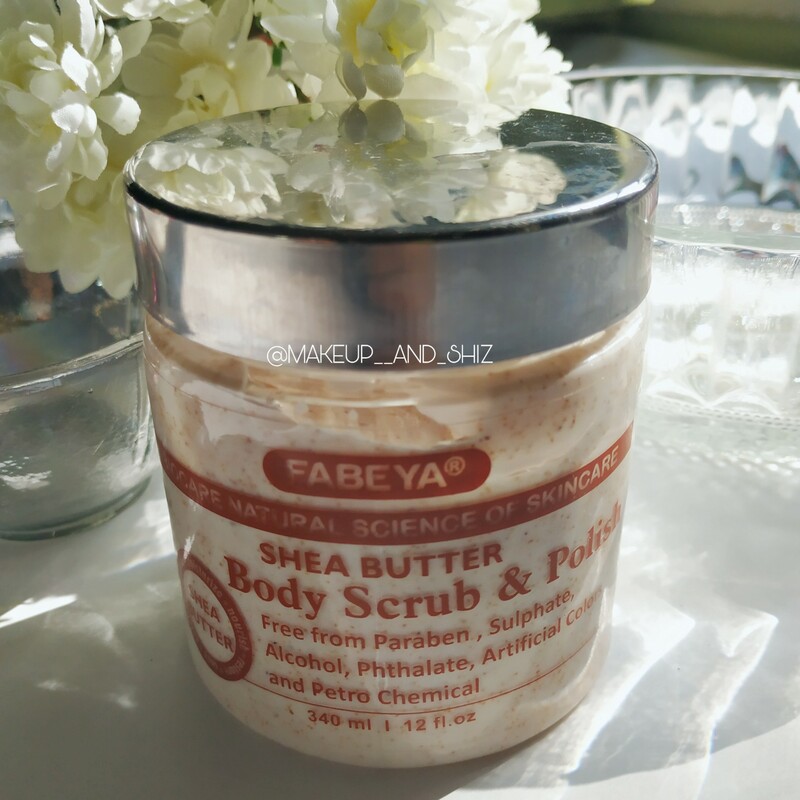 Fabeya Shea Butter Body Scrub and Polish- Review. Fabeya is a new Indian Brand . Fabeya’s mission is to formulate, manufactured and market world class natural products. They make variety of products such as cream, gel, and body & face scrubs. Today’s review : Shea butter body scrub and polish. MRP : Rs 349 for 300 ml. This scrub is best to make your skin soft and supple. The soothing fragrance makes the scrubbing experience much more lively and breathes new life to your skin. Shea butter Scrub has been specially created to nurture and pamper the skin. While the ingredients enhances beauty, the sensual aroma brings about a feeling of total well being and relaxation. The natural ingredients cleanse, nourish and moisturize your skin to make it soft, fresh and radiant. It is basically creamy in consistency but has Walnut shells in it, making it look granular . You can obviously feel the granules too. Other than that, it moisturized my skin too! Most scrubs tend to make my body skin dry after use , but this one didn’t make my skin dry at all. With long term use , it will give you a polished and soft skin . If your body skin is sensitive , then you might think about it . Or else it’s definitely a yes ! Also read : FABEYA Cocoa Butter Cream — Review. Scrubs the dead skin away. Removes tan with prolonged use. I find it bit harsh for sensitive skin. That is all for this post. Have you used any products from Fabeya ? Let me know. Previous The Balance Mantra Rosemary Essential Oil- Review. Next Dot and Key Hand Cream Sanitizer+ Moisturizer – Mandarin & Lime — Review.